Florida National University is a long standing member of the Service members Opportunity College (SOC) and is accredited by the Commission on Colleges of the Southern Association of Colleges and Schools to award associate, baccalaureate, and master degrees. Florida National University enables Soldiers, whether active, reserve and/or National Guard members, to complete quality degrees at a distance wherever they are stationed or at our facilities in South Florida. Florida National University accommodates the unique lifestyle of our active duty Service members and their spouses whose location, relocation and time constrains make traditional college attendance difficult, if not impossible. Our academic degree programs follow SOC DNC Student Agreements and the programs allow the Service member to engage on a degree accredited program wherever he/she may be stationed at. GoArmyEd is the system of record for all enrollment-related transactions. Soldiers must use GoArmyEd to request Tuition Assistance (TA-funded) classes at our institution and any others. 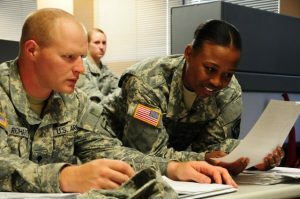 Army procedures require Soldiers to go through the http://www.goarmyed.com portal to request Tuition Assistance (TA-funded) classes and register for attendance at Florida National University. Soldiers are also required to register through FNU Military Affairs Department. Procedure To Request A Tuition Assistant Form (TA). Soldiers desiring to use TA at Florida National University must complete a TA Request form via GoArmyEd. They are required to enter information about the class, including tuition cost, into the form and print out the same after it has been approved by an Army Education Counselor/Education Services Specialists (ESS). Service members present the printed/approved TA Request form to our school as a promissory note when registering for their TA-funded classes in lieu of paying out of pocket tuition. In case of any changes, Service members must withdraw from classes directly via the Florida National University Registrar’s office, as well as submit their Drop/Withdrawal Request through GoArmyEd.